The minimum you can purchase is 100 KHS with a regular price of $4.25 USD per 100 KHS or $42.50 USD for 1 MHS hashrate. The mining contracts are with 1 year duration and everything is included in the price of the hashrate, so there are no extra fees that you need to pay. It is not very clear however what will happen if Ethereum switches to POS phase before the end of your 1 year contract. There is a promotional code available that can help you get 25% discount from the regular price for purchases of 10 MHS or more, just enter the following discount code when checking out HF16ETHASH25M. If you don’t want to pre-order cloud mining hashrate and wait for the mining to start, then you can always go to Genesis Mining that has been offering users ETH hashrate for quite some time and after you purchase it will start mining for you right now. 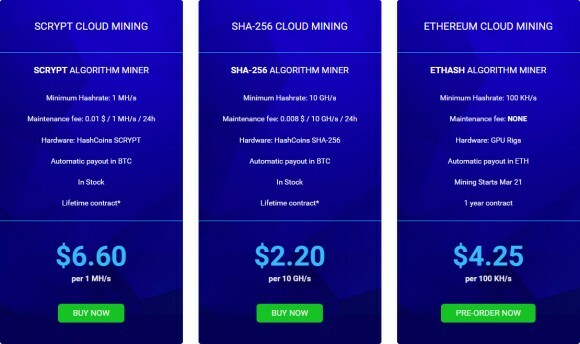 The cloud mining service provider Hashflare has officially announced their plans to start offering Ethereum cloud mining hashrate with pre-orders already active and mining expected to start on March 21st. The contracts are with 1 year term with everything included in the price of the hashrate, so no extra expenses for the user. The price is set at $4.25 USD per 100 KHS (0.1 MHS) or with other words $42.25 USD per Megahash worth of Ethereum mining hashrate. There is currently a promotional offer for pre-orders that will allow you to purchase hashrate at a discounted price of $3.74 USD per 100 KHS or $37.4 USD per MHS (12% discount for the pre-orders) if you use the following promotional code when checking out HF16ETHER12. The service is already offering Bitcoin and Litecoin cloud mining hashrate contracts, though both are being paid to users in BTC. 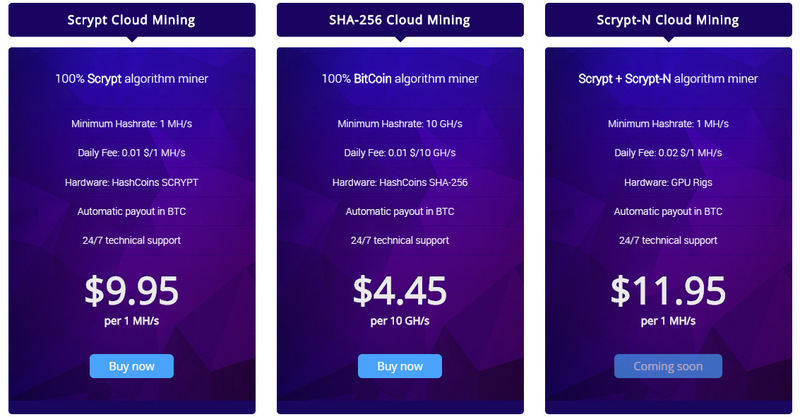 Their new Ethereum cloud mining offer is apparently based on what Genesis Mining is already offering, though Hashflare apparently wants to attract customers with a lower price. The problem is that they have announced their plans about 1 month prior to actually starting to mine Ethereum and for that 1 month a lot can change – much higher mining difficulty or significant drop in price etc. that makes this investment riskier. There is also no information what will happen with the purchased hashrate in case Ethereum switches to PoS before the end of the 1 year term of the contract. So be careful when weighting in the pros and cons of this offer. HashFlare is a new cloud mining service that we’ve just discovered, apparently a part of the European company HashCoins that manufactures ASIC miners. There is a bit of controversy surrounding the ASIC maker, but it has been available for a while and apparently has shipped some miners already with more available for pre-order. We have not tested any of their hardware miners, but their cloud mining service is something that we are going to be testing. If you are interested in their mining hardware we suggest that you read a bit about the company and their products released so far, as their upcoming products do not seem very attractive price wise at the moment. Their cloud mining prices do seem a bit more interesting though, but don’t expect them to be the best out there. 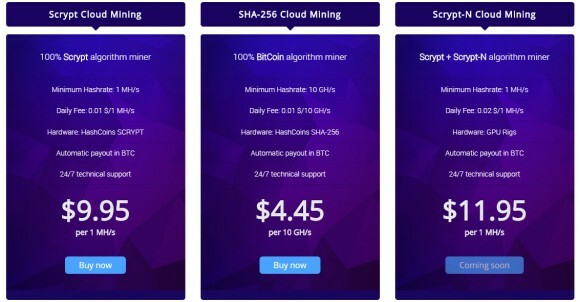 It is interesting to mention that the cloud mining service does offer Scrypt Cloud Mining at $9.95 per 1 MHS, something that is not worth investing at all at the moment in due to the very high price per megahash and very low ROI you can expect (less than 1 USD a month) due to the daily fee of $0.01 USD per megahash. The Bitcoin cloud mining hashrate prices do seem much better than he Scrypt ones, though we’ve seen better than $4.45 USD per 10 GHS with a daily fee of $0.01 USD per 10 GHS. Interestingly enough the service apparently also plans to offer Scrypt-N cloud mining powered by GPUs, even though that has not been profitable to mine for quite a while now and with the mother company having already announced upcoming Scrypt-N capable ASIC miners. So if you want to check the service out the only thing that is worth to go for is the SHA-256 cloud mining hashrate, and as usual we would not recommend to go with a large investment in a new service that has recently been launched. 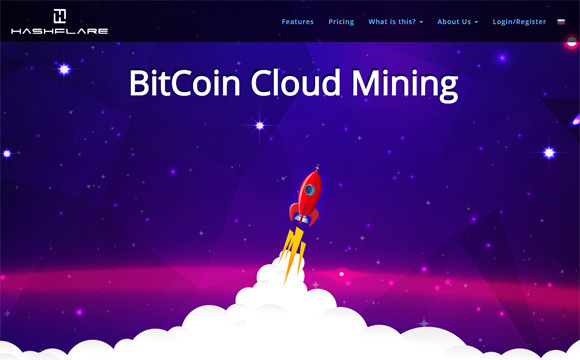 We have already purchased 100 GHS worth of Bitcoin cloud mining hashrate as an initial test at the service just to test things and we have even found some promotional codes that can give you discount from the regular prices. So if you do want to try HashFlare you might want to use the promo code for 5% off for purchases over 250 GHS – HF15SMMR5P2 or 20% off for purchases over 2500 GHS – HF15SMMR20P2, the codes should be valid for Scrypt hashrate as well. We have paid for the hashrate with Bitcoins and as soon as the first network confirmation was received the hashrate was available in our account, so it started mining for us. There are alternative ways to pay for hashrate such as with wire transfer or a credit card also available aside from the BTC option. You can apparently also purchase additional hashrate with coins you have mined and have available in your balance, so you can easily reinvest some of the miner coins for more hashrate. 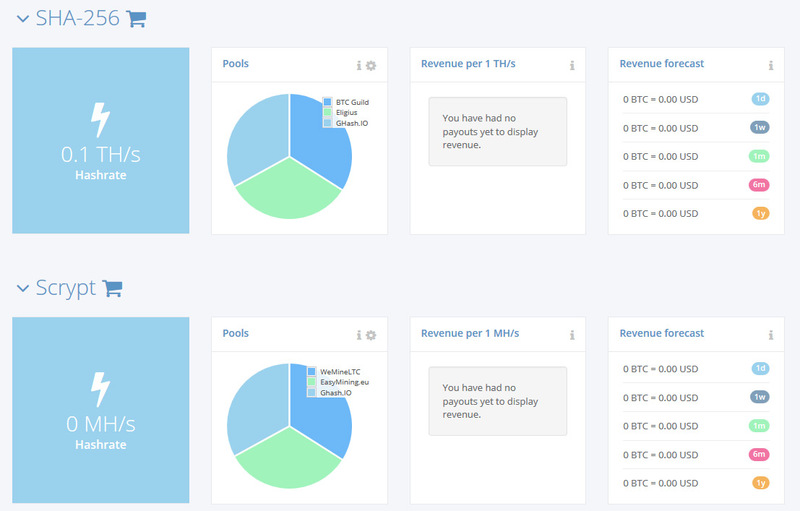 Another interesting feature is the ability to select up to 3 different pools to spread your hashrate from a list of pools available, you do not need to add workers or to have registration in any of the pools available. Do note that apparently the poos you choose and the percentage of your hashrate available at each pool may apparently affect your mining profitability.